Easier said than done. I watch Johnny wade into the river at a small opening among the willows. The current instantly grabs his legs as if to take him down, but he makes confident if slow progress into the riffle with short shuffling steps, and starts to cast. His style of casting isn’t something you would find in a book or demonstration video. He uses a mongrelised Spey flick which relies on the current to load the rod, because even a half backcast would result in a sure snag in the willows. But though his casts are not pretty, they are effective. Not three plops of a heavy nymph from starting to fish and Johnny is hooked up to a vigorous trout which tears downstream in a blur of gold. There is a long and furious battle, a seesaw of give and take with neither man nor the fish giving in. Johnny, his legs trembling against the relentless current, feet seeking purchase on a riverbed as slippery as banana skins, is reluctant to follow downstream where the flow is even faster and deeper, and the trout, strong from a life spent in this muscular water, uses the current like a seasoned wakeboarder. But clearly Johnny is an old hand at this. Slowly, he brings the fish in, guiding it through an obstacle course of sunken sticks and trailing branches, mindful of all the overhead line hazards. He releases the fish midstream, the barbless hook making it an easy pluck. “Very impressive,” I yell out, but Johnny does not hear me. With another of those mongrel casts he is hooked into a second trout, almost in the same spot the first one came from. This goes on for a while, fish after fish from barely a few square metres of fast water until Johnny motions me in to have a turn. My own rod is rigged up for dry fly—the inimitable Coloburiscus, no less—so I borrow his, clearly a proven set-up. It is a #7-8 weight walloper, with a long thick leader, a single bomb of a caddis nymph and no indicator. Casting with it feels like wielding a fireman’s axe. But that’s the easy part. The current is so swift you have to start stripping the line even before the fly hits the water or you’ll never catch up on its drift and feel the take. This makes for athletic and furiously fast fishing. I lob two dozen such casts, each time stripping the line like a madman but nothing happens. “You musta caught them all,” I quip. “There are no fish here anymore.” Just as well I didn’t bet on it. Johnny goes back in, and with a couple of those ugly casts of his, bang!—the axe of a rod is bent double again. Then again. Clearly no shortage of fish, more a shortcoming in my angling skills. I’m hanging out for some dry-fly action, as Johnny had extolled the Coloburiscus hatches that used to be so consistent here you could fish them all day, seeing trout rising in nose-to-tail lines to mayflies so large you could just about hear their wings flapping as they came off the water. A few duns are fluttering about, rising in a slow and stately manner as befits their size, but we see no trout intercepting them. The fish ignores the first two casts, Johnny’s upside-down Coloburiscus imitation bouncing down the fast and narrow feedline, but the third time around there is a quick splash, then the familiar heaviness on the line as I lift the rod. The fight is short as I muscle the fish in, not letting it run for fear of all the snags and branches. The trout is maybe four pounds, whisky gold and speckled like a gem. It vanishes the instant I release it, the water into which it returns black again and seemingly fishless. I sit in the tall grass of the bank, silently relishing that inner glow that comes when you’ve worked for a fish long and hard, and then it all happened just perfectly—the sighting, the cast, the fight and release—like a miniature lifetime condensed into a few moments. Have I mentioned that Johnny Groome is pissed? End-of-his-tether enough-is-enough kind of pissed. The river on which he spent his childhood, which he has fished regularly and frequently over the past 28 years, is about to be ruined—and the process is well advanced. 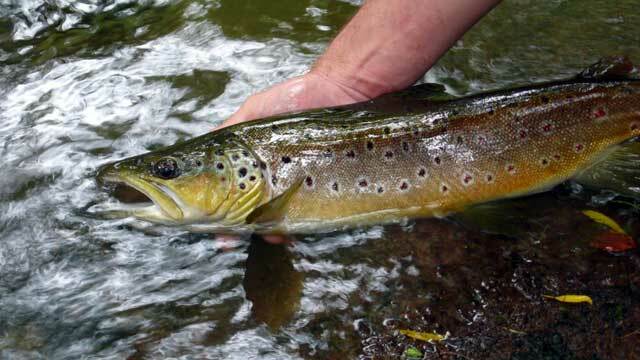 In another hare-brained scheme of trading world-class trout for cheap megawatts a power company has been given a go-ahead to develop a hydro project on the river which would effectively spell the end of the Arnold ecosystem and its fishery as it is now. Oddly enough, when the hydro scheme was first mooted all the traditional defenders of wild rivers showed little interest. Fish & Game ostensibly chose to focus on other, more important, river-saving battles, of which there are never any shortage. The Arnold’s whitewater kayakers opted for a pact with the devil and got concrete slalom course . This left only Johnny willing to fight, and it also left him hopping mad because, as he sees it, no one knows the river as well as he does, and so no one else knows what is about to be lost. Johnny Groome took the power company to court, and into a David-and-Goliath confrontation. But for all his passion and knowledge of riverine ecology, Johnny isn’t cut out for the ruthlessness of a courtroom affray, and so the real-life Grisham-style characters of the corporate world made short work of bringing him down. They cited technicalities and befuddled the key issues in swathes of legalese. His case was trivialised, his papers misfiled, his arguments refuted by fishery scientists of dubious motives and unclear allegiances. Which is why Johnny wrote and self-published Arnold Gold, and why he is now filming a DVD to show the true nature of the river and its remarkable ecosystem. 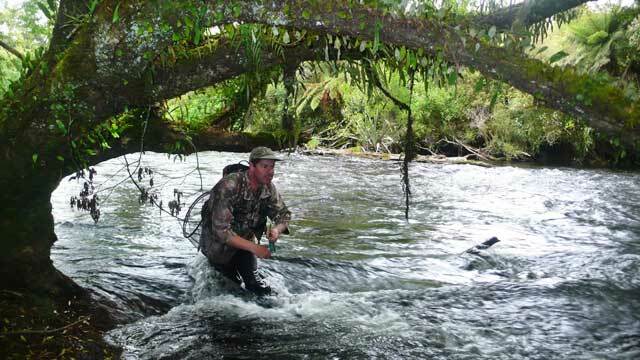 “They all marginalise the Arnold, saying that the fish numbers are insignificant,” he says. 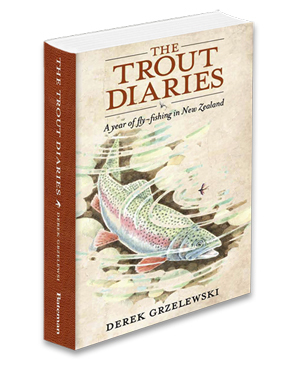 “Well, the point is that if you transplanted the river to England, say, among all those famous creeks and hallowed waters of fly fishing, the Arnold would overshadow them all. “The water clarity is low here, and so any drift-dive fish count gives a seriously false reading. For a start, most of the time you’re in whitewater, trying not to drown or get strained against trees and snags. Then, most of the fish will be gone before you can get close enough to see and count them. I know this because I’ve tried to film them underwater, and it’s impossible. The visibility is only about two metres, so you can’t see the fish at all. But you can catch them.” Watching Johnny do just that, I have no doubt his river holds an enormous quantity of fish. Come and fish the Arnold. Johnny Groome would love you to. Unlike the rest of us, so secretive about our rivers, he wants everyone to know about his favourite water, because this may be the only way he can protect it from ruin. Most of us choose our home rivers but in rare cases it is the river that does the choosing. It seems to me that the Arnold could not have chosen a more devout defender. POST SCRIPT: At the end of last year the hydro company in question has shelved the Arnold project indefinitely. But Johnny’s work has continues. “You just can’t be too vigilant,” he told me.